As commodity markets have continued their expansion an extensive and complex financial industry has developed to service them. This industry includes hundreds of participating firms, including asset managers, brokers, consultants, verification agencies and a myriad of other institutions. Universities and other training institutions have responded to this rapid expansion of commodity markets as well as their substantial future growth potential by launching specialized courses on the subject. The Economics of Commodity Markets attempts to bridge the gap between academics and working professionals by way of a textbook that is both theoretically informative and practical. 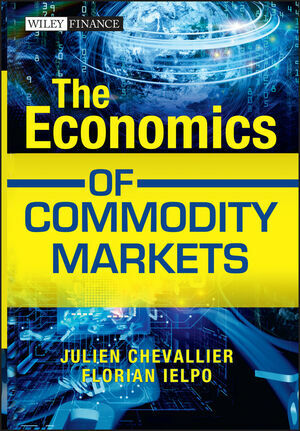 Based in part on the authors’ teaching experience of commodity finance at the University Paris Dauphine, the book covers all important commodity markets topics and includes coverage of recent topics such as financial applications and intuitive economic reasoning. The book is composed of three parts that cover: commodity market dynamics, commodities and the business cycle, and commodities and fundamental value. The key original approach to the subject matter lies in a shift away from the descriptive to the econometric analysis of commodity markets. Information on market trends of commodities is presented in the first part, with a strong emphasis on the quantitative treatment of that information in the remaining two parts of the book. Readers are provided with a clear and succinct exposition of up-to-date financial economic and econometric methods as these apply to commodity markets. In addition a number of useful empirical applications are introduced and discussed. This book is a self-contained offering, discussing all key methods and insights without descending into superfluous technicalities. All explanations are structured in an accessible manner, permitting any reader with a basic understanding of mathematics and finance to work their way through all parts of the book without having to resort to external sources. Dr. Julien Chevallier is a Tenured Associate Professor (Professeur des Universités) of Economics at the University Paris 8, where he undertakes research and lectures on time-series econometrics applied to financial, commodity and energy markets, including carbon markets (EU ETS, Kyoto Protocol). He is a member of the Dionysian Economics Lab (Laboratoire d'Economie Dionysien,LED). He is also a member of the Center for Geopolitics and Raw Materials (Centre de Géopolitique de l'Energie et des Matières Premières, CGEMP-LEDa) at the University Paris Dauphine, and Visiting Researcher with EconomiX-CNRS at the University Paris West Nanterre La Défense. Prior to this position, Dr. Chevallier was an Assistant Professor of Economics at the University Paris Dauphine [2009-12]. He received his Ph.D. in Economics from the University Paris West Nanterre La Défense in 2008, and his M.Sc. in Economics from the London School of Economics in 2005. Dr. Chevallier has previously held visiting research positions at the Grantham Institute for Climate Change of Imperial College London, at the Centre for Economic Performance of the London School of Economics, at Georgetown University, and at the World Bank. Dr. Chevallier is the author of the book Econometric Analysis of Carbon Markets(Springer). He has published articles in leading refereed journals, includingApplied Economics, Energy Economics, Resource and Energy Economics The Energy Journal. Furthermore, Dr. Chevallier currently serves as Associate Editor at Energy Economics, at the International Journal of Global Energy Issues, and at the Journal of Stock & Forex Trading. Additional Memberships of Editorial Boards includeLow Carbon Economy, Advances in Energy Research, the Journal of Modern Economy and Management; as well as Guest-Editing special issues at the Journal of Energy Markets Sustainability. Dr. Florian Ielpo is Investment Manager & Associate Researcher at CES – Université Paris 1 Panthéon Sorbonne. He acts as an Investment Manager in the asset management branch of a bank in Switzerland. In the meantime, he is an Associate Researcher at the Centre d'Economie de la Sorbonne in Paris, France. His expertise is built on an on-going combination between professional skills gained from building decision tools and strategic decision making, and active academic research focusing on the application of econometric tools relating economics and finance. Florian completed his Ph.D. in Financial Econometrics from the Sorbonne University in Paris, France while working as an Economist in the banking industry. He then occupied various positions, moving from an Econometrician position to becoming an Active Investment Manager. He teaches selected aspects of applied finance at the Sorbonne and Dauphine Universities and at the Ecole Nationale des Techniques Avancées (ENSTA) in Paris, France. Florian's peer-reviewed scientific publications can be found in various journals such as Quantitative Finance, the Journal of Forecasting, Finance Research Letters or the Journal of Investing.